LIFEPAC 9th Grade Math has a concept-by-concept approach to learning that will fine-tune student's' grasp of algebra! Students will not only learn graphing, determinants, and quadratic equations, but will also experience achievement as they complete each rewarding worktext lesson. 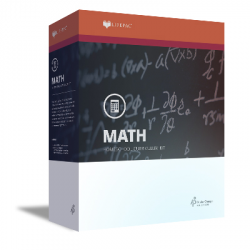 The LIFEPAC 9th Grade Math Set contains ten worktexts and a teacher's guide (these may also be purchased individually).